I have been thinking about skiing / snowboarding for a while now. As the weather gets warmer here in Hong Kong, the opposite is happening in Sydney and New Zealand. Around this time each year, I would be thinking about skiing, however, last year for some unknown reason, we did not go to the snows! Could be the fact that we went to the states in May and then I went back to Indonesia for 2 weeks for engagement and a wedding. It was the first year in 14 years in a row that I had not gone skiing! I remember one year, I was so obsessed with the snow that I went 6 times, which included one trip to Japan and 5 weekend trips to Perisher and Thredbo! I first learnt how to ski when I was 17 / 18. It was my first trip to Perisher with friends and we were staying for the week! For most of us there, it was the first time we were skiing, and we all decided to get lessons! It was probably one of the best decisions we made that week. I didn’t fall in love with it at first, it was one of the hardest and most challenging things I have ever done! But seeing how graceful some skiers were I was determined to learn and pick up the sport. I remember the first day on the slope which was tough and challenging and I still remember the pain the day after. From memory, we were all in pain and decided NOT to ski that day, and thought we would go to the pub, shoot some pool and drink beer at 10am and continued until 10 pm – NOT the best decision we made that week! The next day, we all had the worse hung over but decided that we should continue pursuing our career in skiing and made it to the slopes by 8.30 am. Needlessly to say, some of us did have to stop and chunder – it was not a pretty sight. I didn’t pick up skiing as easily as I have hoped. That year, I came back again for a weekend and felt a little more confident, and each year, I improved (you would hope! ), and made the whole experience a lot more enjoyable! I was able to parallel turn, instead of just skiing straight down (which if you didn’t know picks up a lot of speed) and by the end of my 5th year of skiing, was comfortable with doing black runs and super steep slopes! I’m not one of those skiers who can do stunts, jumps, turns or twists, it’s not why I learnt! I learnt because I love the speed, the speed of skiing down the mountain, the wind blowing in your face, and being at the top of the mountain and seeing how steep the hill is! Each year, I try to go at least 3 times (yes I know obsessive!) but that’s how much I loved it. I organized a trip with my friends to Japan and I have to say, it was the best trip I have ever been. Unfortunately, I don’t have the photos here, in fact I don’t have a lot of skiing photos – don’t know where it all went! We had a great time skiing, night skiing, goofing around and drinking a lot! Going with friends who are fantastic at skiing will push your limits and improve your ability to ski. 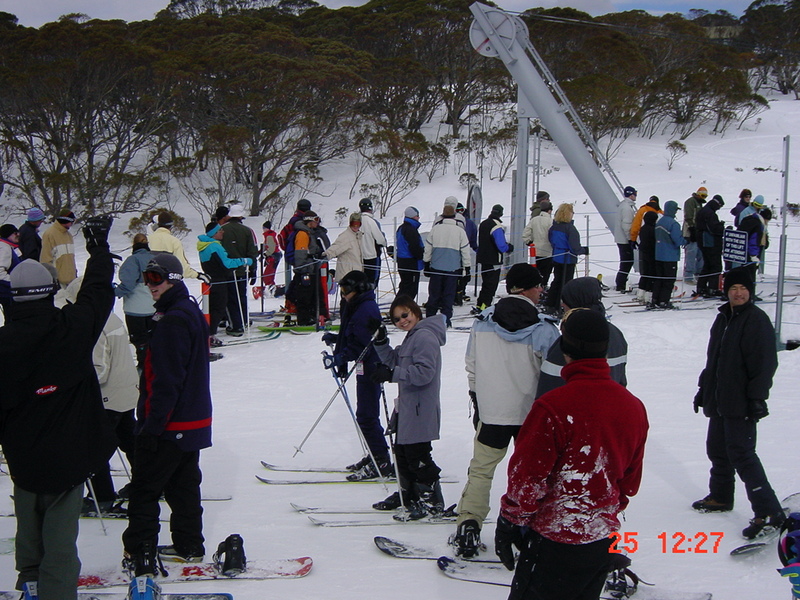 Below is a photo of me at Perisher, can’t remember which year it was but I have to admit – that was one daggy ski gear! I put up with it for about 5 years before I bought new gear, and spending an obscene amount on a jacket and pants – which I have worn and kept ever since! After about 10 years of skiing, I wanted a new challenge – as much as I LOVED skiing, and still do, I turned into the dark side and decided to try snowboarding! Yes, yes, am too old for boarding right? Well that’s what I thought; I didn’t think I was going to pick it up. I had the BEST teacher though, our friend, A, he was a boarder, taught me how to board in a weekend! It was SO MUCH easier to pick up, the boots, OMG, it was so much more comfy, and the board was SO much easier to carry than skies! I turned from a ski bunny, to a boarder!! I know skiers hate boarders and vice versa, boarders like to cut skier and etc etc, but my gawd… I fell in love with boarding.. I wasn’t very good at it though, but I most certainly enjoyed it. The worst thing about boarding is the falling! You either fall on your bum, your knee or in some cases, me, face plant down the slope! It’s not pleasant but so worth it! My fear to date are T-bars, they are my worst nightmare! I don’t think I have ever accomplished going up a mountain on a T-bar – usually fall mid way or close to the top! I really do need to get over my fear! I’m itching to go this year, this would be the 2nd year in a row that I have missed out on the snow! 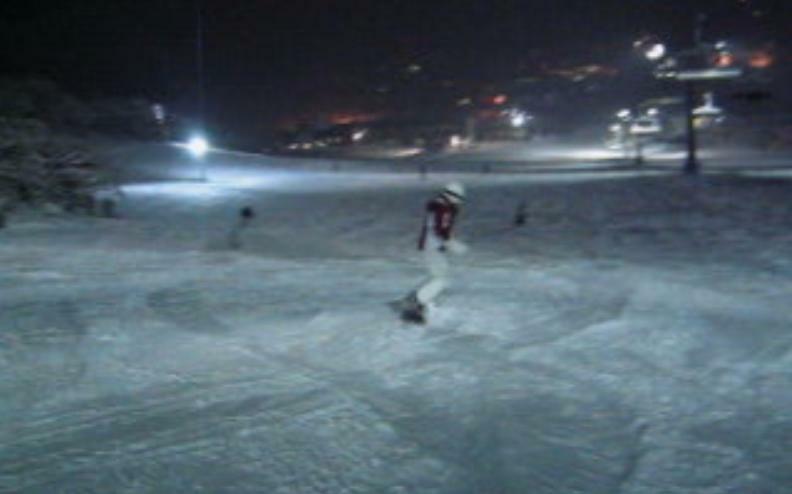 Below is a photo of me night snowboarding one year at perisher. I have to admit though, the last time I went to the snow, I switched back to skiing, and after 3 years of boarding that was tough! I am definitely a better skier but boarding is way cooler! I have had some of the most amazing trips with friends skiing / snowboarding. The shenanigans, the laughters, the face planting, the falls, it has been incredible! I am itching to go again this year! I haven’t skied in a lot of places, mainly just Australia and Japan, however, this year I am secretly hoping to squeeze in New Zealand, when I am back next in Sydney. If not, Japan again next year! I’m definitely looking forward to the hot chocolates, the warm donuts, the fire place, the sauna and most of all… carving it on the slopes! Who’s in with me?